Sale fell through due to buyer's inability to obtain financing. Prepare to be wowed by this MOVE IN READY all brick twin home nestled between Baynard Village and Brandywine Hills in Wilmington. 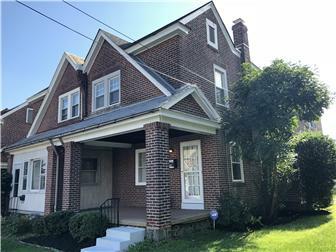 With 3 bedrooms/1.5 baths with an extra toilet in the basement, this home is newly renovated and filled with tons of new features! As you first walk in, you will love the classic, original wood floors and brick front fireplace in the living room. The living room leads seamlessly into the bright and sunny dining room with a Brand New remote controlled fan and Brand New light fixtures, and then into the redone kitchen. This kitchen is any home cook’s dream with Brand New stainless steal appliances including the refrigerator and dishwasher. Brand New granite countertops and Brand New tile fitting round out this amazing kitchen! All three bedrooms have immaculate hard woods throughout and tons of natural sunlight. The full bathroom has been totally remodeled with Brand New tiles and Brand New fixtures. The steps to the front and back door have been replaced and the basement features a walk-out bilco door and a large pool table, perfect for a bonus room! With a desirable driveway for private parking in the rear of this house, this home won’t last long! Close to the Brandywine Zoo, Route 13, I-95, and 202, this bright and sunny home is ready and waiting for it’s new owner! Book your tour today!